I AM CANADIAN! – Today I stood with 295 other immigrants from 61 different countries to pledge ourselves to a country different from the one of our birth. I’m actually kinda emotional. It’s a big decision, made more challenging by the hoops and loops and paper work one has to submit to of course, but still – at the end – it’s a decision to change (or in my case add to) my country of obligation. This day is 5 years in the making – that’s how long it’s taken from the day I paid my fee – till today – sitting here among 294 other applicants that have been accepted and must now say our Oath. I pointed out to my husband that we are looking at the sea of Canadian Diversity. All colors, shapes, and sizes of humanity are represented. And there are a sea of different outfits – ladies in their go to church finery, men in suits, men in t-shirts, ladies in dresses, ladies in jeans, ladies in sari’s, in sequins, wearing hats (that’s me! ), wearing hajabs (maybe 5%), one lady in a Nijab (including her face covered), it’s a sea of differences, all joined together for this one very short period of time. It’s a graduating class – and behind the carefully numbered rows of 301 seats are row upon row of family seating. There are parents, there are kids, there are friends, there are family members. Despite the clear insturctions to only bring one family member, no one is being refused – despite the obvious over abundance of participants. Cell phone cameras at the ready – everyone is taking pictures of themselves standing in front of the flags of every Canadian province that are proudly displayed on the stage, bracketed on the left and right by the Red and White Canadian flag. Clearly not the first time they have done this (when asked they admit to 4 ‘big’ ceremonies a week – all summer!) – the staff uses the divide and conquer way of channelling people – We were all asigned a seat when our invitations were sent – I’m #16 – front row – far right – and by seat number we are greeted, our Permanent resident cards taken away – and our participation noted. I didn’t have my original papers – I came to Canada in 1974 – they are long gone – but this wasn’t even a problem. They just note that they are lost – and move on. The atmosphere in the relatively crowded room is respectful, albeit filled with the occasional cry of a child. New Canadians seem to arrive with kids – or at least their family that attend have kids. I’m not worried about our population growth – that’s for sure. As new Canadians – we got a pampflet with pictures of all the Canadian Symbols – and a small lapel pin with the Maple Leaf. These pampflets are often part of the picture taking procession – clutched proudly, held firmly, pointed to when the camera flashes. At the end of the ceremony – we’ll receive the grand prize – a certificate saying that we are now Canadians. Oh didn’t think of that at all – but right you are! And wearing my British Fascinator – such a stylish Canadian, eh? 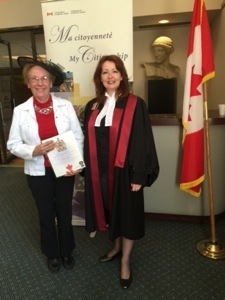 Congratulations Leslie, Grannie, Mom and now proud Canadian! Congratulations Leslie. It finally came to fruition. 5 LONG years in the making – and I’ve lived in Canada since 1974. Would have been so simple 15 years ago – so I’m taking the blame on this. But it was a very cool ceremony… Now to get a passport!